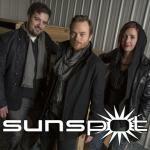 Sunspot- See you at the MAMAs! Hypnogogic is about the state between waking and dreaming. The split seconds where your dreams seem solid and appear in the real world. Written, performed, acted, and edited by Sunspot.